I think we can all agree that it's great when a company can upcycle what would otherwise become landfill waste -- say, for instance, an old highway billboard -- into a useful product -- say, for instance, a weekender duffle. Turns out an old Gucci ad can live a happy second life as a surfboard bag, iPad mini sleeve or cardholder wallet. 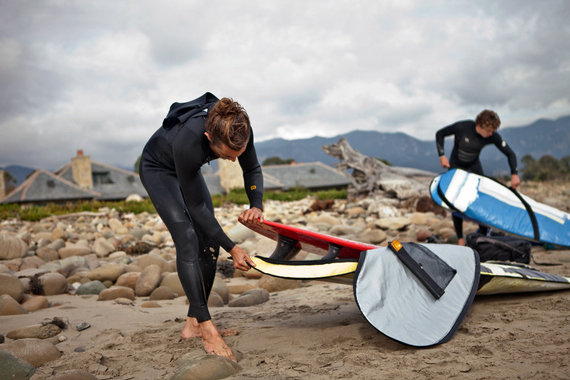 Rareform, a California-based company, found a way to use old billboards to create surfboard bags, totes, backpacks, hip pouches, wallets, SUP blade covers and more. To feel the bags, you'd be hard pressed to guess what they once were. To look at them, however, you instantly know they were once something else, from the bits of lettering, images, patches of color that aren't overtly "ad"-y, but may prompt double-takes or conversations. Rareform intercepts billboards before they reach the landfill. 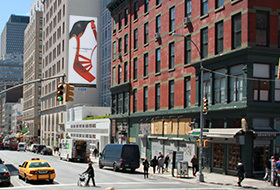 Each billboard is made of heavy-duty, water-proof, mildew-proof vinyl. I had no idea that billboards are made of vinyl, and if you didn't either, well, we're not alone. "I had no idea that billboards were made of vinyl," co-founder Alec Avedissian, 30, told me. "Like most people, I didn't really think about billboards or what happened to them after" they're taken down. That was until the lifelong surfer and native Californian took a life-altering trip in 2011. Avedissian walked away from a career in investment banking to "clear his head" on a six-month surf trip through six South American countries with some friends. He cites that trip as sparking the idea for Rareform. On his odyssey, he not only learned that highway billboards are made of darn sturdy stuff, but he saw recycled billboards used as roofing for homes by residents of a village in El Salvador, and an El Salvadorian friend showed him a tote bag he'd made from an old billboard. "I was amazed at the ingenuity that came from necessity," he told me. That trip inspired him in another way: it inspired him to start a business that would benefit society. "One of the guys in the village where I was living in El Salvador started a fishing cooperative, so the local fisherman could sell their fish to the capital city," he said. "In Nicaragua I met the owner of a water-filtration plant that provided clean drinking water to rural communities. He was employing drivers, factory workers, and others in a very poor community (and) providing a lower cost alternative to the bottled-water on the market. "I was constantly writing down business ideas along the way, and made a point to talk with all types of business owners from all walks of life," he said. "I was awed at the number of ways people were making a living and ...increasing the good in the world. I wanted to do the same." Back in California, he tried his hand at making a surfboard bag out of an old billboard. "Friends of mine really liked it. I had a few people ask for one, and so I had to find a way to make more," he said. And so, in 2012, he and his brother Aric co-founded Rareform. Lamar Advertising Company has an ongoing partnership with Rareform to extend the life of its old billboards. Rareform "intercepts" billboards on their way to the landfill: "We have contracts with outdoor advertising companies and work with them to reduce their footprint and provide them with a way to recycle," Avedissian said. "Once billboards come down, we have our team pick up the vinyls from their facilities and take them to ours to start the process." 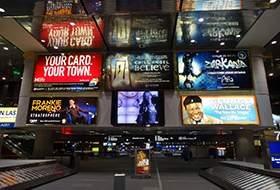 A typical billboard is 14' high and 48' wide -- a lot of landfill waste. "We could get around 200 backpacks from one billboard if we had 100 percent yield," he said. Not every billboard makes for a great duffle or wallet, however. "We have strict cutting requirements where we don't use any logos, food, faces," he said. "We know in the end, the customer wouldn't want those bags so we make it a priority from the beginning to make sure that we don't use those." To make, say, a backpack, they sort through raw billboards and cut everything to table-size. They then cut a backpack pattern and "make sure that the cut billboard pieces look good and meet our criteria," Avedissian said. They then give the cut pieces to their sewers who "meticulously craft the vinyls" into a backpack. Products are sold on their Web site and in some 250 brick-and-mortar stores, such as Patagonia, REI and Whole Foods, and independent surf and outdoor stores around the world. They've also joined Patagonia's 1% for the Planet campaign. Since 1985, Patagonia has pledged 1 percent of sales to the preservation and restoration of the natural environment. In 2002, founder Yvon Chouinard, and Craig Mathews, owner of Blue Ribbon Flies, created a non-profit corporation to encourage other businesses to do the same, according to Patagonia's Web site. "We have always had the highest respect for Patagonia and what they continue to do, their 1% for the Planet being a big piece," Avedissian said. "From the beginning, we wanted to make it in our ethos of our brand to give to organizations that were making a difference and so it was a natural fit." "Our cardholder wallet. I use it everyday. Whenever I take it out to pay for anything, it's a conversion starter," he said. "I wish I used my surf bag more though--that would mean I was surfing more which is always a good thing."